This system enables you to perform automatically controlled behavioral experiments without the disadvantages of an artificial setup such as skinner boxes or running wheels. An animal in the setup is observed with a video camera mounted above the experimental arena. The camera is connected to a computer running the VIEWER software. 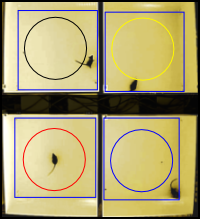 VIEWER analyzes the video, identifies the animal, determine its position (head, body and tail), draws its track and issues a comprehensive set of data.